Sometimes you struggle for a long time to learn something, and you don't feel like you've really made much progress. But when you learn something new and somewhat similar to it, the learning curve is greatly reduced. It's a great feeling. That's what happened with me recently when I tried to learn Laravel for a work project. Because of the time I spent with Rails, it made learning Laravel so much easier! Laravel is a MVC framework for PHP very similar to the way Rails is for Ruby. Because a lot of the concepts are similar, I created a chart of equivalent syntaxes that could get someone who is already familiar with Rails started in Laravel much quicker. Overall, I really love Laravel. In fact, I think I like Laravel more than Rails (while I still like Ruby way more than PHP). There are obviously a lot of similarities to Rails, and you can't take away the fact that Rails changed the landscape and paved the way for Laravel. But there are also many things that are different as well, and make Laravel really shine. I'll try to write about those in a future post. Udemy's RoR Tutorial: Learn from Scratch I was turned onto this tutorial by Molly Elizabeth, who works at Udemy. I haven't gone through the tutorial myself, but it looks like a very good resource if you're just starting out in Rails. If you try it, let me know what you think. PHP: The Right Way a very good 10,000 feet birds eye view of the somewhat gnarly PHP scene. It's not the prettiest language, but recent iterations have been able to salvage it a bit. This site is a super useful resource if you have to do PHP, and it covers best practices, how to organize your code, pitfalls you can avoid, etc. Laracast these video tutorials are clear, concise, and very useful when learning Laravel. Jeffrey is a really good teacher and communicator, and he covers the topics at just the right speed. Highly recommended. Craft CMS I've been working with ExpressionEngine for a while, and while very powerful, it is still a bit frustrating and inflexible at certain things. Craft was designed by people who used to design plugins for ExpressionEngine, so they know all the painpoints and they have been able to create a really amazing product. Check it out if you're looking for a really well thought-out CMS. DigitalOcean paired with ServerPilot. Setting up your stack can't be simpler than with these two tools working together. DigitalOcean provides the servers on the cloud and ServerPilot gives you a really nice control panel to configure them. And the interface of both sites are simple and elegant, and much less headache-inducing than AWS. ... speaking of which, if you have to deal with AWS, here's a really great resource: AWS in Plain English. It comically translates AWS services into what they should have been named in the first place. Nice intuitive names rather than EC2 or S3. Many books and tutorials are designed around building out one feature from the ground up and then moving on to the next one. While I admire that kind of workflow where you focus on creating working tangible features, I also noticed that for almost every feature, the programmer would have to touch the model, controller, and view. That kind of moving back and forth makes it hard to really understand the structure of the app, at least for me. So I decided that for my next app, I was going to do an experiment. Instead of developing each feature, I developed all the models up front. This allowed me to really think about the data structure behind my app and how each part interacts with the whole. I also aimed to do test driven development, by writing tests for each model and their associations before moving onto the next model. The downside of this approach is that by the end of this experiment, I still didn't have one tangible feature, at least not from the user's standpoint. And of course designing the models up front doesn't mean I won't have to change them later when I realize the constraints have changed. But I think it's a good learning experiment, allowing me to not worry about the controllers or views at all, and just focus in on how to connect all the different pieces. There's much more to it, but those are the very core features. Since I love Goodreads and there are a few things I'd like to change about it, I decided to make my next app be a Goodreads clone. I think part of the reason I could design the complete model first is because I'm so familiar with the existing site and know beforehand exactly how each part is supposed to work. That said, I did make a few changes in my version, which I will talk about later. What follows isn't a complete step-by-step tutorial on what I did, but rather a few highlights (or lowlights, depending on how you see it) of my experience building this out. A huge part of this exercise was figuring out how to work with rails associations. You know, those has_many and belongs_to calls that magically link up your models so that you can simply call school_of_the_sun.editions instead of having to write out complicated sql joins (that's the last book I read and loved by the way). I won't go over the basic associations, as I think the documentation is not bad. However, I will talk about some of the more tricky associations that I ended up implementing. One challenge in terms of associations is testing them. Luckily, there is a gem out there for that. It's called Shoulda and it's really easy to use. I first learned about it in Michael Hartl's Rails Tutorial, but I quickly forgot about it. One of the challenges when reading that book without any prior experience was that it presented all these different concepts together, so that I didn't understand which commands were part of Rails and which were part of Ruby. Similarly, what is part of RSpec and what has been added to it by Shoulda? Over time, much of this has cleared up. Goodreads doesn't have tags. Instead they have shelves. But it's a bit confusing, because they have two types of shelves. The first type are exclusive shelves. A user must add a book to one and only one exclusive shelf. Examples of exclusive shelves are "read", "to read", and "currently reading". A book cannot be both "to read" and "currently reading" because that doesn't make sense. The second type of shelf is just a shelf that acts more like a category. You can add a book to as many non-exclusive shelves as you'd like. Examples would be "travel", "romance", "books with blue covers", etc. Lastly, each user defines his or her shelves, and gets to set which shelves are exclusive and which non-exclusive. When it came to implementing my solution, I thought having the same name and 2 different behaviors was confusing. So I created two separate models. One is the shelf model, which acts like Goodread's exclusive shelves. And one is the tag model, which acts more like tags do on the rest of the web (and kind of like Goodread's non exclusive shelves). Shelves were the simpler of the two. A shelf has_many copies (the concept being that you don't own a book, you own a copy of a book). And a copy belongs_to a shelf. Tags were a little more complicated. I ended up creating an intermediate Taggings model so that each copy can have many tags and each tag can have many copies. This Railscast tutorial explains what I did pretty well. A reader can like a review or a following or a status. A reader may also comment on reviews and statuses. I would like to have just one Like model and one Comment model instead of several different ones tied to different tables. For example, I could do ReviewLike, FollowLike, and StatusLike. But that's so inelegant, and whenever I want to add the capability to like something else, I would have to write a whole new model and migration for it. Instead, I decided to use polymorphic associations. It's a great solution for this situation, I think! Basically a polymorphic association allows you to use one model (Like in this case) and bind it with two or more models through a foreign key and a type (which tells the model which model to bind it to in each case). So when I like a review, that type will be "Review" and when I like a status that type will be "Status". Comments work the same way. On Goodreads, a user can enter a general status update. This is like "Hey I'm having a great day." and is not tied to a book. But they can also enter a status update on a book. This is like "Hey I'm reading 'Wittgenstein's Nephew' by Thomas Bernhard and I'm on page 47 and here are my thoughts...". The second type of status update is tied to a user's book (copy model in my case) and can include a page number to show progress. Other than that, the two statuses are the same. So I really wanted an elegant solution here instead of creating two separate models. I read up on single table inheritance which seems like a really cool use of inheritance to not repeat code. I wasn't sure this would be the right solution because copy status has two extra data fields. But I liked the idea that a copy status is basically just a status with extra functionality, so therefore it inherits from it. So I decided to implement it. And I'm glad I did--now I understand why STI is the wrong solution in this case. I had to rollback and start again. The problem in this case is that CopyStatus not only has 2 extra fields, but one of them is a foreign key field that references copy whereas Status has no foreign key fields. This represents not only difference in data, but also difference in behavior. While I think it could still work, this has gone from a somewhat elegant solution to a total hack. It's even less elegant than the two models I started with. While following is a one-way relationship (you can follow someone but they do not have to follow you back), friendships are a two-way relationship. You both agree to be friends. This poses an interesting problem in that when I say Demetrius.friends I want the model to return all of Demetrius's friends. That means everyone in the friender column where friendee is Demetrius and everyone in the friendee column where Demetrius is the friender. Luckily, I found a Railscast that showed two ways of doing this. One uses a gem and one a self-rolled solution. I avoided the gem because the self-rolled version seems just as simple and easier to customize (less dependencies, too). For my purposes, I also have to think about the fact that a friend has to request someone to be their friend, then that person has to agree before the friendship becomes official. I added an accepted field to the table for this purpose. I'm not sure if this will be sufficient or if I'll have to create a separate FriendRequest model, but I will find out soon when I try to implement it. One thing I thought of that could be different is whether or not I needed the copy model. What if I got rid of it? Well then the problem becomes, how does one Edition has_many Readers (through shelves) as well as one Reader has_many Editions? Someone suggested a has_and_belongs_to_many association here as a possible solution. Another thing I'm wondering is if I could get rid of the rating and review classes. Since they belong to copy, could I just have rating and review as fields in Copy? Do I lose something from doing that? I learned that I really like thinking about models and focusing on them exclusively, at least in the beginning. I also made some big mistakes that I will not make again. One is that the model-database connection is not automatically in sync. When I was testing this I was running into some weird problems. I finally figured out that just because I updated something from one model does not mean all the other models have updated from that same set of data in the database automatically. I have to reload the model in order for it to fetch that data again from the database. I definitely want to start building out the controllers and views and start making this actually work and look good! My models aren't complete. There are others I need to add eventually, as well as many fields and things like validation that I need to add. But for now it is a good big-picture where I can get started building. There will likely be many challenges in the future and my models will probably have to change and adapt, but that's all part of the process! 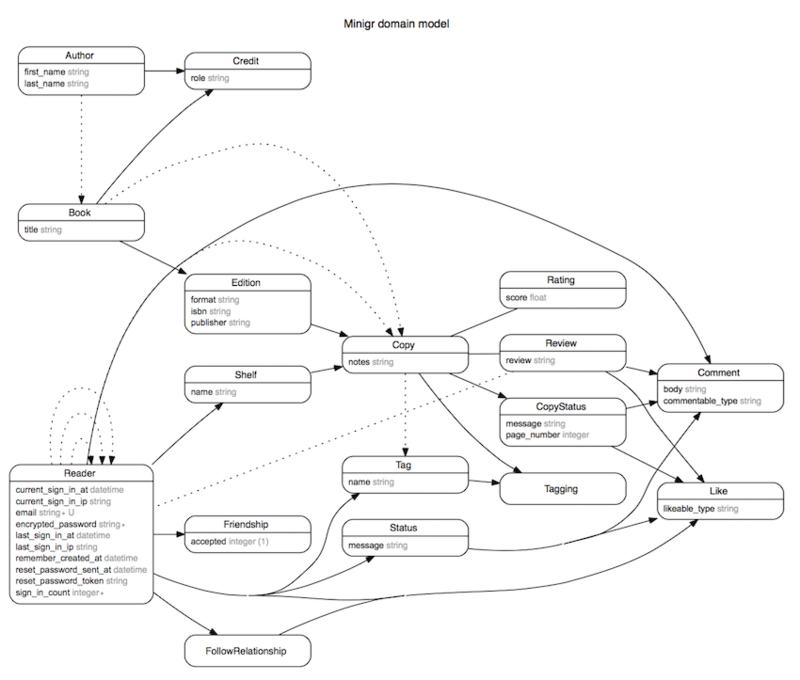 I'm in the middle of a super long post about Rails models. It is quite involved and is taking a long time to write. So in the meantime, I present you with this relatively shorter blog post composed of mostly links. I recently got a new MacBook Pro! So I spent a day installing and setting up my system for the perfect workflow. I experimented with different set ups, and ended up installing and un-installing several things. Also sometimes I'd install something, and realize I had to install something else first, etc. So here I will try to just show you how I would do it if I had to do it again, without all the mistakes. install Oh My ZSH because it's really cool looking! Get ALL OF THE PACKAGE MANAGERZZZ! PHP came with my Mac! (type php -v to see if you have it first) but I still had to configure it (scroll down to PHP). Jekyll or this blog didn't happen! install todo.txt command line todo list tool! Phew! Did I miss anything? Do you have any suggestions? Let me know! Not so long ago, I was learning Git for the first time. I was going through tutorials and picking it up pretty quickly. No big deal, right? I understood the basic concept of version control, and I can type simple commands. The problem is that whenever I used git outside of those tutorials and ideal situations, I got stuck because I didn't understand how it worked behind the scenes. There are many tutorials that go through the motions of using git without telling you how to think about what's going on. On the other hand, resources that teach you how to think about git aren't nearly as prevalent as those beginner tutorials that teach you what to type. So here are three of the most useful resources that helped me level up on git beyond the very basics. Think Like a Git is a website dedicated to that "aha" moment. Do you think there's something magical about git? There really isn't. It's just that you don't have a mental model of git yet, so everything that happens seems like magic and kind of mysterious. Reading this tutorial was enlightening and really put me on the track of being comfortable with git, even when I messed up and didn't follow a normal workflow. In Git for Ages 4 and Up Michael Schwern walks you through adding, committing, pushing, and a whole bunch of other git commands while playing with Tinkertoys! The visual element really makes this a wonderful resource. Unfortunately, the video isn't of the highest quality, and there are a lot of interuptions and tangents. But overall, it's really helpful. Jessica Kerr @jessitron is a great speaker and in Git Happens, she not only leads us through a few more difficult commands but also helps us understand why git is hard, and why it's worth it. I loved how she talked about how git not only allows you to save your work, but also allows you to tell the story of what you did any way you like. Please note that Jessica actually prefers this version of her talk, but the one above was the one that I originally watched (and I still prefer it).